This carefully organized, engaging, comprehensive, and contemporary guide to analyzing research articles has become a classic in the field. 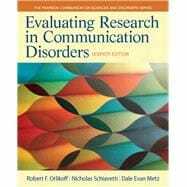 With its primary focus on reading, understanding, and evaluating professional literature, and its emphasis on the different research designs and types of publications that can inform all components of evidence-based practice, Evaluating Research in Communication Disorders, 7/e gives readers a logical, highly useful organization that reduces redundancy and improves efficiency; focused study questions that help develop critical evaluation skills and guide student projects that involve the evaluation of research literature; and up-to-date references, current research, and new topics keep readers aware of the most contemporary findings in the field. Robert F. Orlikoff, Ph.D., is Professor and Chair of the Department of Speech Pathology and Audiology at West Virginia University. He has extensive experience as a researcher, clinician, and educator and has served as an associate editor and reviewer for several journals in communicative sciences and disorders.